Euro 2016 Group A consist of hosts France, who look to have an easy task against the likes of Romania, Switzerland and Albania. 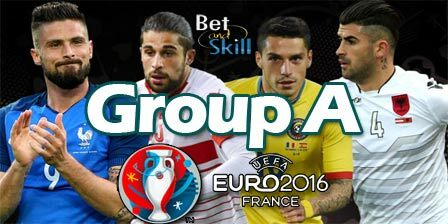 Find here our Euro 2016 Group A betting preview including predictions on Group Winner, To Qualify, To Finish 2nd, To Finish Bottom and Straigh Forecast. Plus, the best odds, free bets and no deposit bonuses on the Euros! France reached the quarterfinals of the last World Cup where they were edged out 1-0 by Germany, but they look much improved this time. As the host nation, France didn’t have to go through qualifying games but have kept busy in the last couple of years with a series of twenty friendly internationals. Overall the results have been good with only four defeats in those matches and an excellent 2-0 win over England. With the talents of Antoine Griezmann, Dimitri Payet, Anthony Martial and Paul Pogba in their squad, Les Blues are expected to top their group. Switzerland failed to qualify for the last two European Championships and have never advanced further than the group stages. As for their qualifying campaign, Petkovic's men qualified from Group E finishing nine points behind England after losing 'to nil' twice as England outclassed them on both occasions. The other defeat came away to Slovenia. Their preparation for Euro 2016 has hardly been ideal as they have lost four of their past five games. Granit Xhaka, Xherdan Shaqiri, Ricardo Rodriguez and Stefan Lichtsteiner are the most important players of the squad. Romania eventually finished runners up to Northern Ireland in Group F of qualifying in a very easy group, which saw and Hungary also advance. Anyway, they had the best defense among all European teams, only conceding 2 goals over the course of the 10 qualification games with a remarkable 8 clean sheets. Furthermore, they have conceded a grand total of seven goals in their last 22 matches, keeping clean sheets against the likes of Argentina and Spain. They feature a squad without many star players. Vlad Chichires is the main component of their defence, Ciprian Tatarusanu is a good goalkeeper but they will need to improve offensively. Albania is one of the surprise packages at Euro 2016 as manager Gianni De Biasi has done a fabulous job with a rather ordinary group of players, considering that they made it through a very tough group that included Portugal, Denmark and Serbia. With only seven goals scored in their seven completed qualifiers – five of which came against Armenia – they are arguably the weakest team at the Group A but the lack of pressure could lead them to play good football. Their most high profile players are Nantes defender Lorik Cana and Napoli’s Elseid Hysaj. "Euro 2016 Group A predictions, betting tips, best odds and free bets"